Counter-top/retail display box. 40 large warmers per display box. 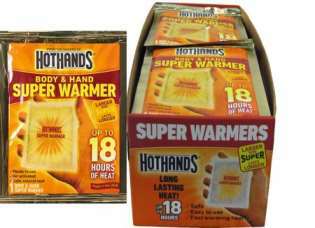 HotHands Body & Hand Super Warmers are larger (4 x 5) air-activated hand and body warmers designed to last up to 18 hours providing safe, comfortable warmth in the coldest of temperatures. When placed in pockets or between layers of clothing, these warmers will help you enjoy cold weather activities longer, whether its hunting, fishing, working or just being a spectator. Individually sealed in airtight package to guarantee a shelf life of six years.